Note: On 18 March 2016, the EU and Turkey agreed on a deal to stop refugees from crossing the Mediterranean. At that time, Maria Gabrielsen Jumbert and Pinar Tank warned that the agreement was advantageous for Europe and Turkey but not for the refugees whose rights to protection were severely compromised. On Friday 18 March, Turkey and the EU concluded a deal designed to put an end to refugees’ use of the sea route to travel from Turkey to Greece, because the route is costing too many lives, and because the EU and Turkey want to get the flood of refugees under control. The majority of the refugees and migrants who have arrived in Europe in recent months have travelled via this route. The EU’s website claims that the agreement “removes the incentive to seek irregular routes to the EU, in full accordance with EU and international law”. The core of the deal is a “one in, one out” system: for every Syrian refugee the EU sends back across the Aegean to Turkey, another will be resettled from Turkey to the EU. There are several doubtful aspects to the agreement, which came into effect on Sunday 20 March. Firstly, the EU has imposed a cap of 72,000 on the number of Syrians who will be granted asylum in Europe. This is far below the 108,000 refugees a year recommended by international humanitarian organizations. This limit continues the practice that has been in force in recent years, a consequence of which has been the gross underfunding of the UNHCR’s efforts in Syria’s neighbours, and notably Turkey. This bartering in human lives is now being described as the EU’s “refugee bazaar”. 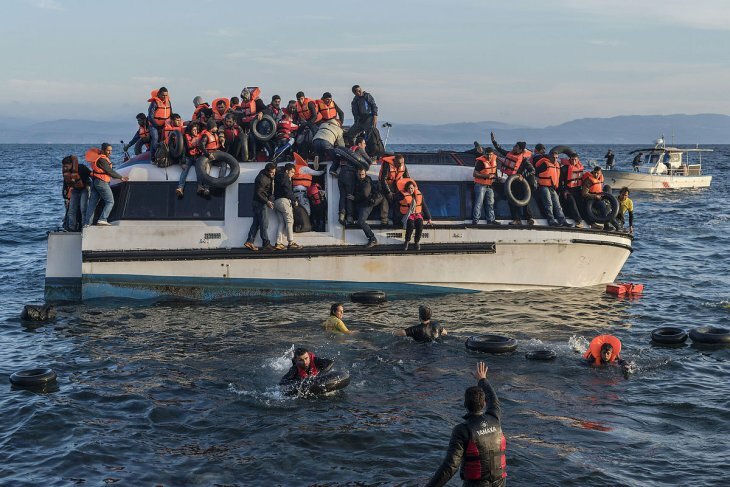 In addition, the “one in, one out” system will not necessarily be as efficient or generous as it may seem: some have asked whether it doesn’t increase Turkey’s incentives to send more refugees by the sea route, forcing the EU’s hand in taking in more quota refugees. But even more importantly, by returning those who attempt to take the sea route from Turkey, the aim is to put a stop to this route fairly quickly. This begs the question: Will the EU then continue to limit its refugee quota to only the dwindling number of refugees who use the sea route to reach Europe? And finally, under this agreement, Syrians have a right to asylum in Europe, while Afghan and Iraqi refugees will simply be returned to Turkey. Secondly, implementing the agreement will be a challenge. As of today, Greece does not have a functioning asylum system that gives refugees access to interpreters and the opportunity to lodge appeals. Now approximately 4,000 extra personnel – judges, case handlers, border guards and translators – have to be put in place over the course of a few days to implement the agreement. According to Chancellor Merkel, this will guarantee that every asylum application will be processed individually, with the opportunity to appeal and given proper supervision. Thirdly, the agreement involves compromises within the EU regarding Turkey’s relationship with the organization. Turkey, which since 2011 has taken in 2.8 million refugees and paid USD 10 billion out of its own pocket, will now receive a total of USD 6.6 billion by 2018 to fund humanitarian organizations that are working with migrants. The “one in, one out” deal is intended to put human traffickers out of business, but it will only succeed in doing so if it provides real access to protection. In addition, the visa requirement imposed on Turkish citizens travelling to Europe will be lifted if the country complies with certain conditions. (These are the same conditions that were imposed on Serbia, Macedonia, Moldova, and Bosnia-Herzegovina in order for their citizens to benefit from visa-free travel). Finally, the EU has promised gradually to re-engage in negotiations with Turkey concerning possible EU membership. This comes at a time when Turkey is conducting a brutal domestic war against the country’s Kurds and the human rights situation is the worst it has been for several decades. As such, the criticism that Turkey has engaged in cynical politics based on self-interest and has negotiated itself into a better deal with the EU by exploiting the recent refugee situation, is justified. But if so, Turkey is certainly not alone in pursuing its self-interest. If the EU has opted to swallow some unwelcome concessions in its deal with Turkey, it is because the organisation is willing to do almost anything it takes to put an end to what it sees as an “uncontrolled flood” of refugees. For as long as the perception of a “Europe under siege” continues, the influence and threat of right-wing parties continues to grow. In Germany, Angela Merkel has seen her principled position met with increased fears about a flood of refugees which recently resulted in increased support for the Alternative für Deutschland (AfD) party in German state elections. In France, the Front National succeeded in attracting 28% of the votes in the first round of regional elections in December, admittedly a few weeks after the terrorist attacks in Paris. Similar shifts in public support for right-wing populist and anti-immigration parties are apparent in Austria, Finland, Sweden and Denmark. The EU prefers to keep the migrants outside Europe, in order to then control who should be allowed to enter. A refugee deal that succeeds in winning back power from the right wing is certainly an overarching, if not an explicitly stated, goal. This is important not only for the political climate in each individual country, but is also seen, at the end of the day, as crucial to further European cooperation in the long term. Thus, the primary motivation for entering into the agreement is to obtain a form of control over the “flood”, and not least to put an end to what has gradually become – despite its difficulties – the easiest way into Europe: the sea route. This in itself says something about how impenetrable the other routes are for those fleeing their homelands. And if Turkey has put pressure on Europe, that is also to a large extent because the Turks were well aware of their new position of power: The EU was ready to go a long way in order to regain some sense of control. In addition, the agreement is in line with what the EU has always been attempting to achieve through its border controls: to deal with migrants at arm’s length, outside the EU’s own borders. The EU prefers to keep the migrants outside Europe, in order to then control who should be allowed to enter. This is instead of letting migrants first enter Europe and then controlling who should be allowed to remain and who should be returned to their country of origin – a more costly process, both politically and economically. Apart from the practical difficulties of repatriation, there is also a widespread view that once refugees have come within Europe’s borders, they have come to stay. This is partly a result of the EU’s own asylum and immigration policies: Because it is so difficult to enter the EU, few people take the chance of leaving out of fears that they will never be able to return. The new agreement does not make access to the EU easier, but contains the fundamental flaw that it drastically reduces refugees’ overall possibilities to seek protection. The desire to put an end both to the human traffickers’ business model and the hazardous sea transits is both justifiable and of central importance. But the focus continues to be on penalizing those who take this route, rather than structurally addressing why this route exists in the first place. The sea route is there because of the lack of any other safe and legal means of entering the EU. Returning refugees to a third country requires that third country to be safe, with realistic possibilities for handling asylum applications. Many people do not believe that Turkey currently meets this requirement. Furthermore, human rights organisations such as Amnesty have pointed out that Turkey has since January 2016 sent refugees back to Syria in contravention of the “non-refoulement” principle of international humanitarian law. In conclusion, the “one in, one out” deal is intended to put human traffickers out of business, but it will only succeed in doing so if it provides real access to protection. As it now stands, it only serves to limit the EU’s refugee intake to those few who may still attempt to travel by sea, while penalizing people who attempt to find the best route to safety and tolerable living conditions. This text was first published in Norwegian as an op-ed in Aftenposten 26 March 2016. You can read it here. The English translation of this text first appeared on the PRIO Blog in April 2017. You can find the original post here.